That is about all I can say about the race last night at the BMW Performance Center Test Track. In our 4's and 5's combined race, three Greenville Spinners finished in the top four. I'd like to think I had a small part in it. If I didn't, don't tell me. I will enjoy my fantasy. Work got me off to a late start. By the time I got there, signed in, and got my number on I only had a couple of minutes to warm up. Then we were called to the line. The track is like a cross between a road race and a crit. It is too long really to be a traditional criterium, but it has some corners that definitely give it the crit feel. What else to you expect at an automobile test track? This made me a little nervous. The last time I raced in a crit, I went down. As we went into the first left turn which then turned into a right turn and then back to a left, I was on the inside. Wow, you really have to trust people in there! I have to admit, I wasn't very trusting! Each time through for the first several laps, I lost ground as I tried not to be the cause of a crash. Thankfully, I never even came close. Then we hit the back stretch. This is a long straight away that leads the length of the entire course and then ends in a sweeping left turn that puts you onto the front stretch. From there it is a pretty straight shot to the finish -- though it is also an incline. The race was to ride for 35 minutes and then two laps. For the first 10 minutes I was wondering what I was doing out there. Not being able to warm up meant I was feeling pretty rotten. Honestly, I was just hanging on. Add to that the turns and I was ready to go home. As we hit the 20 minute mark, I started feeling a little better. My legs were coming to me and I started riding to the outside of the pack going into the turns. Not only did that allow me to avoid some of the close quarters, but it also allowed me to make up quite a bit of ground. Before I knew it, there was only two to go. I knew there would be another bunch sprint if things continued the way they were. If I was to stand any chance at all, I would need to be near the front. Coming onto the back stretch, I passed a good part of the field by going wide out of the turn. Then I settled in until we reached the final two turns. As we were going through the turns, I heard someone telling me to "Go! Push it!" Then I found myself in the awkward position of being right on the front -- three abreast. I had a choice to make. I could check up and force the pack to come around me making someone else take the lead, or I could lead out a Spinner's train into the final lap. In just the few seconds it took for me to think it through, I decided to pull. My reasons were 1) while I figure I could get a top 10, I don't think I was in shape for a top three -- which was all that counted; 2) I did not relish going into that first group of turns in a pack -- if I was on the front, I could pick my own line; and 3) it would be kind of cool to play a part in a Spinner win. So, as we came out of the final corner, I pegged it. The one time I glanced back, I saw a bluish purple kit and a Spinner's kit. At least, I knew I had one of my guys back there. Hopefully, there were more because if there was only one, we would be in trouble. I'd like to think I stretched the field out a bit as we headed down the front stretch. I went into that first turn alone and pulled through that section. As I came off the corner onto the back stretch, I knew I had to get out of the way. I went wide right. Several riders went by -- including Spinners -- and then I heard the sound of a crash behind me. Suddenly there were riders jumping to take advantage of the pause. I just kept going at my slower pace. Then three quarters of the way down the straight, I started feeling a little recovered. I even picked up the speed to jump into the main pack. But as we came around the final corner, I pulled up to look ahead and see how we finished. A Spinner got second. I believe it was Brian Flinte. It was cool to see Tony get fourth. It was fun. Next time, though, I'm going to sit up and make someone else do the work! All I would have to do is survive that one section and I think I could have made up for it on the back stretch and final turns. There was some other racing going on. I plan to mention that later in the GreenvilleOnline.com Cycling blog. Here is a video of the downhill on the Furman side of Altamont Road. I'm sure there are people who could make this much more interesting by letting it all hang out on the descent. I'm just not one of them! Looks like it takes me around 4 minutes to go down the road. Right after this video I climbed back up and it took about 13 minutes. I survived the Miracle Hill Cycling Challenge. I rode 100 miles with a ride time of 5:57 and entire time of 6:15. It was pretty tough, but the organization of the ride was wonderful and I had some great guys to help me finish strong over those last 50 miles. Thanks, Billy and Louis, for waiting for me at the top of Caesars Head. Rule number one when you are commuting to work on your bike while wearing slacks: wear something to secure your pant leg to keep it out of the chain. 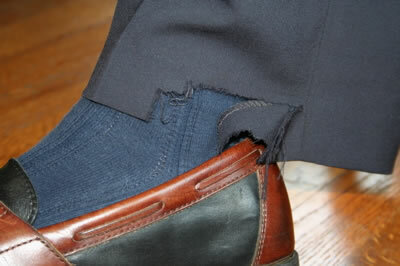 Rule number two when you are commuting to work on your bike while wearing slacks: if the band you are using to secure your pant leg slips off your pant leg while riding a fixed gear, stop and put it back on. I really need your help! I have signed up for the Palmetto Peloton Project's Challenge to Conquer Cancer ride that will take place in October. This will be a 24 hours a day relay ride from the "Hills of Hincapie to the Land of Lance." 1300 miles from Greenville, SC to Austin, TX. However, it isn't the ride that seems so daunting to me... it is raising $5000! I've never expected much of my readers. Actually, I've been surprised how many there are! I'm now asking you to take a moment to give a little something... not to me, but to the Greenville Hospital's Oncology Research Institute. The money you give will go to this local organization to help find ways to improve the lives of those battling cancer... and who knows, perhaps find a cure. $25... $50... maybe a little more? I'm certainly going to be doing my part and giving myself. I just need a little help. Of course, your donation will be tax deductible. Just give and I'll do the riding! You can bet you'll be taking the trip with me as I will be reporting on the preparations for the ride as well as the ride itself. My plan is to blog the ride as well as to capture video of the event to upload as we go along or to place on the Web upon our return. Much of that will depend on the bandwidth we have available to us and the logistics of the road. I'll be honest. I don't have $5000 to put up for this myself. However, I am trusting that there are enough good people out there who will take an interest in this project and join me. I know the courageous battle my friend Mike fought against the cancer that attacked his body. He faced the insurmountable with faith and an indomitable attitude. Certainly I can follow his example in something less daunting. Thank you so much for considering to help me. I look forward to seeing how much we can raise together. Remember, you can easily donate online.